Professional Human Resource consulting in the global mining industry. Our goal is to partner with mining companies who seek to build great teams with contemporary, creative and custom-fit human resource and recruitment solutions. We are forward thinkers where innovation & invention thrive, underpinned with a quality framework that helps solve complex people problems with sustainable outcomes. Engaged to conduct site-wide roster review and salary & benefits benchmarking study for TSX-listed mid-tier with US operations. Conducted reviews & audits of HR practices, policies, procedures & systems in multiple mining operations to identify areas of improvements against industry best-practice. Completed multiple assessments for mining companies to consider site-wide changes to roster patterns including impacts on flights, transport, schedules, camp, fatigue management & costs. Conducted national salary, benefits & employment condition studies for mining companies operating in Mali, Burkina Faso, Ghana, Liberia, Cote d’Voire, DRC Senegal & Madagascar. Developed bi-lingual national and expatriate HR Management, Recruitment & Workforce Development Plans for multiple ASX, TSX and AIM-listed companies moving from construction into steady-state operations. Managed entire recruitment process for Thompson Creek’s $1.6Bn Mt Milligan copper/gold start-up in remote Northern BC, Canada. Conducted 100+ Dover assessments in remote villages in Indonesia to identify potential community members who could be selected for training programs. Engaged to assess, select and recruit 180 skilled and unskilled workers for start-up silver mine in Argentina using remote and field recruitment teams. Starting as a HR Consulting firm in Perth, Western Australia, Globe 24-7 commenced operations working with mining companies in Australia. In 2006, Globe started to grow and with HR Consulting in full swing, introduced Recruitment and Executive Search to its service offering. Globe took its first steps of expansion by establishing offices in Toronto, London and Accra. In 2012 Globe saw that beyond the markets it was already present in, there was an opportunity to support the Latin American Resources sector and established an office in Bogotá, Colombia to service the region. After a decade of operation and growing into a truly international consulting firm, Globe relocated its Head Office from Australia and now administers all global oversight and management from Singapore. A key piece of Globe's strategy came in 2016 when it created 'Globe Competency Assurance' focused on training and workforce development for the international resources sector. 'Globe CA' works with companies to develop & deliver Training Management Systems in emerging and developed countries within the global resources sector. In the years ahead, Globe will continue to work with mining, energy and oil & gas companies to support them with their HR needs, whatever they are and wherever they are with a commitment to 'quality first'. Update, News & Information from around the ‘Globe’. Friday, February 15, 2019 Mozambique: The New Aberdeen? Friday, February 01, 2019 The Responsible Mining Index (RMI): What is it? What’s in it for Mining Companies & HR Professionals? Globe 24-7 is pleased to announce the release of the company’s Quarterly HR Newsletter - Issue 3. Curated for HR professionals, each edition reports on HR trends, topics and issues within the global mining industry. Click here to subscribe to Globe 24-7’s Quarterly HR Newsletter to stay up-to-date with HR topics within the global resources industry. Globe 24-7 (Globe) has been conducting human resources consulting and search assignments for local and international mining, power, manufacturing and energy companies around the world for fifteen years. Globe has offices in the major markets of the world to ensure consulting assignments and search campaigns are effectively managed at both site and corporate locations and has grown internationally to now service small, mid-tier and large-scale companies through its project recruitment, search, HR consulting and HR Systems divisions. The Globe24-7 team attended PDAC in Toronto last week joined by more than 25000 people at what is the largest annual mining event globally. Whilst the conference is expanse in the variety of topics discussed, much of PDAC 2019 centred around Diversity & Inclusion with a particular focus on women in mining. Through leadership, education and innovation, women have opened doors for many other women to participate in our industry and to recognize this contribution, an annual awards ceremony is held by the Women in Mining Canada chapter during the conference. These, and many other women have contributed extensively to the development of the mineral industry to forge a path forward for women in Canada and globally within the mining industry. At the Awards, keynote speaker Marie Inkster, CEO of Lundin Mining spoke about her own personal journey and inspired us all to take a look at the women who surround us as they travel a path within a male dominated industry to encourage and support them in their careers. Lena is the Principal Consultant for North America at Globe 24-7. She has over 18+ years of experience in the mining sector having worked and lived in Toronto, London and New York primarily dealing with Board Consulting, C-Suite assignments and large scale project management. Lena is an executive committee member of Women In Mining Toronto, a member of WIM UK as well as the Global Diversity Consulting Lead at Globe 24-7. Globe 24-7 is very pleased to welcome Lucero de la Puente Muñoz as Globe’s new ‘Business Development Manager - Peru’ based in Lima, Peru responsible for managing and growing Globe 24-7’s presence in the Peruvian market. Lucero has extensive experience in partnering with Junior, Mid-Tier & Tier 1 Mining Owner Teams in the region. She also has a proven track record of delivering highly bespoke specialist support and is skilled at attracting valuable knowledge to the Delivery team in terms of, key industry candidates. Lucero’s operational experience covers areas such as Mine Operations, Exploration, Mine Closures, Hydrology, Metallurgy, Maintenance, Technical Services, Senior Management and Corporate positions. She has placed at all levels within operations and explorations from GMs, Country Managers to Mining Engineers & Plant Metallurgists. Lucero possesses a well-structured Mining background and can easily have a technical conversation with any existing and/or potential client of us. This makes her have a deep understanding of the industry and the importance of feeling critical roles with the best manpower in the market in the shortest possible term. In addition, Lucero brings a bachelor’s degree as a Psychologist as well as other related studies in Coaching and Human Resources Consultancy. She has also completed talent pipeline mapping, salary benchmarking and talent attraction strategies for critical talent segments. Globe’s LATAM Business Development Manager, Juan David Viñas views Lucero’s appointment as a great opportunity for the organization to develop and nurture current relationships within the Peruvian market. Globe 24-7 (Globe) has been conducting human resources consulting and search assignments for local and international mining, power, manufacturing and oil and gas companies around the world for over a decade. Globe has offices in the major markets of the world to ensure consulting assignments and search campaigns are effectively managed at both site and corporate locations and has grown internationally to now service small, mid-tier and large-scale companies through its project recruitment, search, HR consulting and HR Systems divisions. Joining 25,000+ delegates at Toronto’s annual Prospector & Developers Association of Canada (PDAC) conference, Globe was well represented with 6 delegates who spent time in meetings, at presentations and on-the-Investor Trade floor. Whilst temperatures dropped to -15 and snow fell consistently on Ontario’s capital, the sentiment within the conference walls was far warmer with an enthusiasm and buoyancy that came as a welcome change to how 2018 had ended. As a team, we reflected afterwards and viewed the 3-day conference favourably feeling that the overall sentiment could be summed up in two words… ‘cautious optimism’. To understand this sentiment, we need to wind back the clock to the same time last year where there was a buoyancy in the market that hadn’t been seen for many years. Investment had started to return through 2017 off the back of the lesser like commodities gaining global favour; governments in non-typical mining jurisdictions had started to change policy towards opening mining environments; and commodity prices were steadily improving. 2017 ended well and 2018 started in full swing. Fast forward 9 months to December and it’s fair to say we looked back on a market that plateaued due to an industry that again had fallen foul of world events and subsequent investor re-direction resulting in a prevailing ‘here we go again’ sentiment. Whilst 2018 closed soft, there were some wins during the year as gold held its own globally and iron-ore certainly started to re-emerge with a particular spike in the Australian market with many quietly contemplating mentioning the word ‘boom’ as reports of a skills shortage in the trades & skilled areas started to re-appear. As 2019 turns into the new year, PDAC provides a great barometer for the global industry and what struck me at the conference is that ‘belief’ still exists in the industry, and it’s as strong as ever. As I walked the floor, I commented to one of my colleagues how exciting it is to see so many new players in the global mining industry. Through the 13 years I’ve been in the game, it stood out to me again that even in light of ups, downs & plateaus, discoveries are being made; newcomers are entering the market; deals are being done; and belief hasn’t wavered. PDAC offers the chance for hundreds & hundreds of companies, no matter the size to promote their story from Russia to Argentina to Ghana and everywhere between. PDAC is a wonderful reflection of our truly global industry and whilst in 2019 there is a cautiousness, the conversations I had were full of genuine optimism from genuine believers who want to start and finish their story and write their own piece of history. We love being a part of those stories, and we’ll certainly be back again for PDAC 2020 to share in the next chapter of the journey – let’s just hope that through the course of 2019, our industry's temperature guage moves from ‘warm’ to ‘hot’. The remote and sparsely populated province of Cabo Delgado in northern Mozambique appears to be at the beginning of an unprecedented resource boom. The perfect storm of major offshore gas discoveries and the world’s largest known graphite deposit. Against this background is a region with adult literacy just above 50% and an almost non-existent industrial sector. So how can Mozambique exploit its resource wealth and improve the lives of people in the region? The answer is simple but the solution far more complex – develop local skills and local capability. The experience of Aberdeen in Scotland, known as the ‘Oil Capital of Europe’ provides a great case study. Since the discovery of oil in the North Sea it is estimated that nearly half a million jobs have been created in the energy industry. So what did the once sleepy fishing town of Aberdeen do to become not only the centre of Europe’s oil production, but also a global centre of excellence for the energy industry? It started with an acknowledgment that the skills required to develop the industry and the major projects did not exist. In 1969, the first major discovery/development by Philips Petroleum lead to a significant influx of American expatriates. This was facilitated by establishing an international friendly environment to attract oil and gas professionals from around the world. In what may have seemed unusual at the time, American, Japanese, and other International schools were built to support the families of these professionals, ahead of building local training institutions. Aberdeen suddenly transformed into a bustling international city with a Texan accent on the street as common as the distinct Aberdonian. Learning from best international practice and knowledge through ‘skills transfer’ was seen as the first step to developing local skills and capability. Without the international expatriates there was quite simply no local expertise to pass on the knowledge and skills. What has followed over the almost 50 years of oil production in the North Sea has been an unprecedent investment in skills, the establishment of world leading training institutions, universities, and organisations like OPITO (Offshore Petroleum Industry Training Organisation) that have become a global standard. Significantly, it has been a gradual process, an accumulation of global expertise and a long term vision to develop local content and capability. The experience of Aberdeen is one that the new frontiers of resource development should examine closely. Mozambique which is the new frontier needs to embrace the best the world can offer to capitalise on its abundant resource wealth. In 5o years’ time will Mozambique be the new Aberdeen? Who hasn’t experienced a long and painful recruitment process, either as a candidate, hiring manager or HR professional? The importance of a well-structured and conducted recruitment process and the benefits that this brings to any search can’t be overstated. Unfortunately, much too often due to many and sometimes “unexpected” factors, the recruitment process become circumvoluted and drags for too long. the start date is agreed on. Even in a ‘employer’s market’, a good candidate is not available forever. There is the obvious risk of losing the candidate to competition but even more damaging, the risk of having a very disillusioned or disengaged candidate. A lengthy recruitment process generates a loss in productivity, creates a lot of pressure on other employees, generate insecurity and instability and above all, damages the company’s brand. Working in partnership with your recruiting agency and/or internal talent acquisition team, to create a detailed plan before starting the recruitment process, agreeing on milestones and resources and following it effectively will definitively reduce the risks mentioned above. 4 – Once you are set on a candidate, be efficient in the offer elaboration. It is often wise to define the parameters of the offer at the beginning of the search to avoid a long-winded negotiation at the end. We at Globe 24-7 ensure we follow a strict process holding ourselves, candidates and clients accountable; this alone makes a difference in the outcome and makes the investment and trust deposited in your recruitment partner company worth it. The Responsible Mining Index (RMI): What is it? What’s in it for Mining Companies & HR Professionals? The first Global Index on responsible mining, RMI 2018, was released in April 2018. The RMI is an ambitious initiative, covering 30 of the biggest mining companies in the world, which together produce 25% of all mined commodities worldwide, excluding oil and gas. These companies represent 16 home countries and operate more than 850 sites across 40 countries. What does it measure and how? 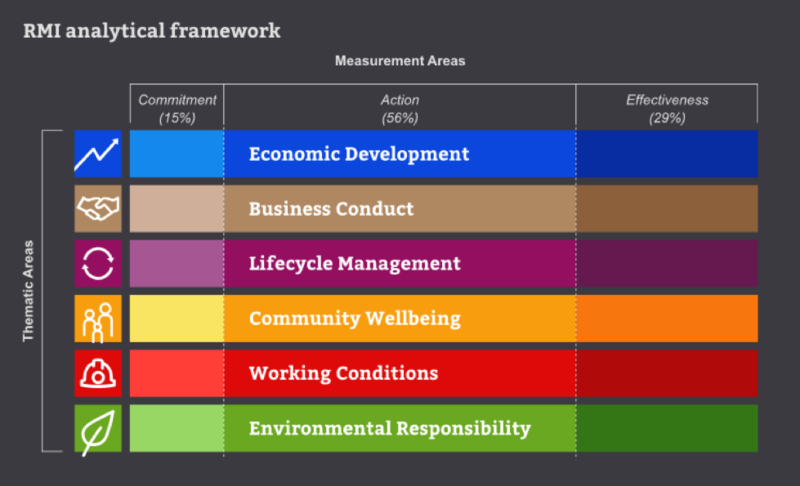 Aligned with the UN Sustainable Development Goals, the RMI evaluates and compares companies on six Economic, Environmental, Social and Governance (EESG) dimensions: economic development, business conduct, lifecycle management, community wellbeing, working conditions and environmental responsibility. The assessment includes 73 indicators applied at the company-wide level across these dimensions. It also considers site-level actions. The RMI determines how well companies can demonstrate, rather than simply claim, that they are committed to responsible mining. It shows that they have established systematic approaches to address issues and that their performance in these areas is monitored and reported on. The RMI assessment is based on publicly available information on these companies. This means that where very little evidence has been found, results will be weak and could be a reﬂection of the level of public reporting on a company’s policies and practices. The RMI’s ‘Working Conditions’ dimension covers the rights of employees and contract workers to work in safe and healthy conditions, to express their concerns, to organise on labour matters, and to receive fair treatment in recruitment, employment and promotion. These are all part of the requirements set out in the International Finance Corporation (IFC) Performance Standard 2 Labour and Working Conditions. Performances are broadly similar across all companies on this topic, with a couple of exceptions at both ends of the spectrum. 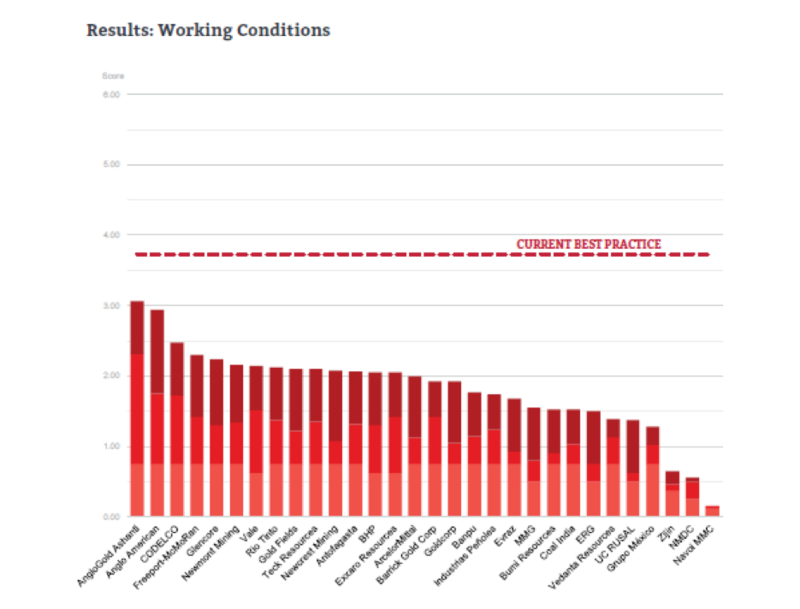 Perhaps somewhat surprisingly, ‘Working Conditions’ was the lowest performing dimension overall. Digging through the report, it rapidly appears that performance is satisfying in terms of occupational health and safety with “nearly all companies have made formal commitments to provide a safe and healthy work environment; and most companies also track and report on their performance in this area and show evidence of efforts to improve their performance on health and safety”, according to the report. Another issue identified in the report as presenting a large performance gap is tracking the levels of workers’ wages against living wage standards, or legal minimum wage. While respecting legal minimum wages is a must that doesn’t require much explanation, the concept of living wages is still in its infancy, its definition subject to much debate, which might explain the low performance noted in this area. Transparently and publicly report site-level performance to workers, mining-affected communities and other stakeholders. It is worth mentioning that the report also identifies strong cases of leading practice which interested companies can refer to as valuable models. The RMI 2018 is full of insights and examples of leading practice in the different areas covered. Globe can only encourage our clients to browse through it. We remain available for any questions or support on these matters. Searching for job opportunities in the global mining industry has never been easier now with the launch of Globe 24-7’s new Candidate Job App on iOS and Android devices. The app gives all Globe’s followers the ability to search job vacancies anytime & from anywhere including the option to set individual preferences that will ‘push’ new job opportunities in real-time. Globe’s CEO Lachlan Spicer commented that “we are incredibly excited to launch Globe’s Job Search App and believe that this tool will provide our followers even greater accessibility to our open vacancies when they are considering their next career move”. From the 4th to the 7th of February Globe 24-7 delegates Paloma Ortiz-Lopez (Business Development Executive), Luis Valente (Global Business Development Manager) and Lena Kozovski (Principal Consultant) will attend this year's African Mining Indaba. The 25th Anniversary Mining Indaba will be big, bold and better than ever. The highly anticipated event will see the largest amount of investors, mining executives and junior miners from across the globe come together for this leading deal making forum. 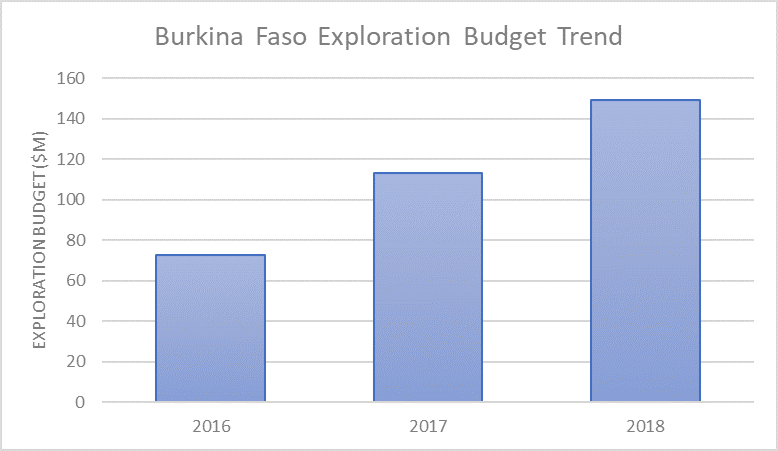 Burkina Faso, a West African country with a significant cohort of operating mines, near completion projects and an exploration budget that has doubled between 2016 and 2018, presents a competitive and vibrant labour market for industry senior professionals and managers. In 2017, Globe were commissioned to run a comprehensive remuneration and benefits survey of Burkina Faso Nationals working within the mining industry. Nine companies contributed to the independent benchmarking exercise with approximately 5,000 employee data points. Globe’s 2018 remuneration study of almost 300 Expatriates working in Burkina Faso mining industry shows gross salaries ranging from approximately USD10K to USD20K per month for Expatriates working as senior professionals and managers. Comparison with National workers at similar levels, based on a 2017 remuneration and benefits survey of Burkina Faso Nationals, presents a predictable disparity, where Nationals are paid at about a third to a half of the salary paid to Expatriates in similar positions. heightened competition for recruiting and retaining talented national staff. Beginning February 2019, Globe will be running its second comprehensive remuneration and benefits survey of all positions for Burkina Faso Nationals working within the mining industry. This report will provide independent and current information to mining companies with actual data that can be used to efficiently and responsibly manage Nationals remuneration and benefits. Global HR Trends, Issues & Topics just for HR Professionals working in the Resources industry.